Cow breed: "We have a mixed herd, and we're breeding towards what we call 'Vermont heritage linebacks.' The lineback genetics can be traced to the first cows brought to America. We're crossing those with [higher-producing] Jerseys and Holsteins to be able to make a living. We're bringing the linebacks into the economic reality of the now." Everybody needs a bit of Hot Farmer in their lives. Nope, we're not offering unsolicited relationship advice, just recommending some delicious dairy. Hot Farmer, part of a line of flavorful farmer's cheeses from Sweet Rowen Farmstead in West Glover, is a creamy, spreadable treat seasoned with chile and jalapeño. You can sample it at farmers markets, along with a nettle-flavored variation, and one blended with garlic and tomato. As adept as the Sweet Rowen team is at making fresh cheeses, it also excels at those that have a little more age. Storm, a bloomy rind, is delicate and delicious. Solstice, washed with the lees of Eden Ice Cider and aged for about three months, is a bit more funky. Selections from Sweet Rowen regularly win American Cheese Society awards. In October, its Mountain Ash won a Yankee magazine Editors' Choice award. Behind these cheeses — sometimes literally, if you catch him at the market booth — is Sweet Rowen's owner, seventh-generation Vermonter Paul Lisai. After a 2011 fire destroyed the facility where he was bottling his milk, Lisai decided to build an on-farm creamery, which he began to operate in May 2012. At the time, Lisai did some of everything, from milking the cows to making the curds. Today, he has a pair of cheese-makers on staff and spends extra time with his herd. We wanted to know more, so we decided it was time for a grilled cheese ... maker. PAUL LISAI: I grew up in Grafton, and my grandfather owns a meat market in Bellows Falls, so we ate a lot of meat. I grew up working in the store, cutting meat with my grandfather and uncles. We had beef, chicken and pork for every meal. My dad kind of broke away [from the meat business] and managed an apple orchard. He still does. We sugared — had a couple thousand taps — and [had] a mail-order business, the Grafton Village Apple Co., with maple, jams, jellies. It never made money, but Dad always had a job. We ate pretty well. SD: When you were a kid, what was your relationship to dairy? Did you have a particular fondness for milk or cheese? PL: I didn't really. [The family of my] best friend in elementary school had a dairy farm in Saxtons River, and I spent a fair amount of time there. I saw his dad and grandfather doing that thing. But I didn't milk a cow until after I got out of college, I guess. Probably not until 2008. SD: Why did you choose Sterling College? PL: My brother went to Johnson State, which isn't too far away, and he was the one who thought it would be a good fit for me. I wasn't going to go to college, and I came to check [Sterling] out, and I was like, "Oh, I could do this!" I was pretty interested in working outside at that point. SD: You studied forestry. How did you end up getting into dairy farming? 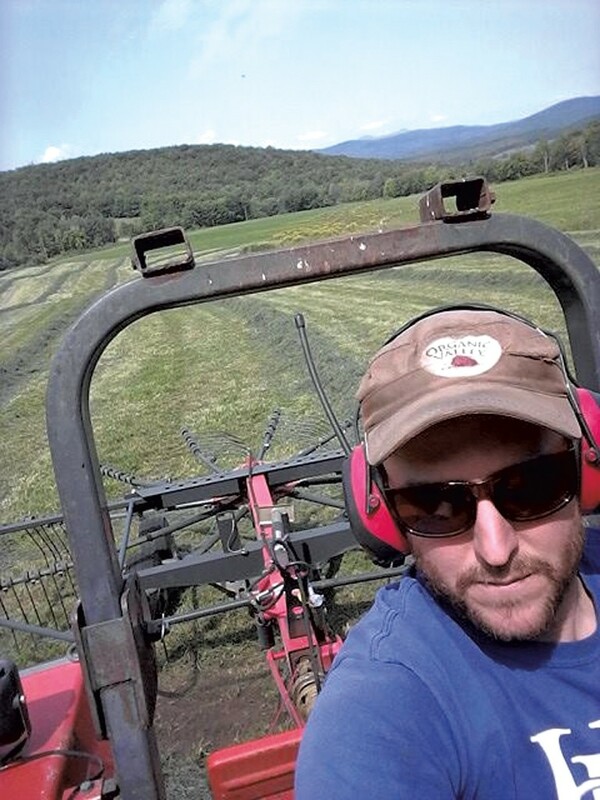 PL: The reason I farm [is], I love the tradition of it, and I love doing something that's so rooted in this part of Vermont. If I'm going to live in the Northeast Kingdom, there aren't that many opportunities to do something I enjoy and something that's good work. Watching some of these cheesemakers try the value-added thing made me think there was a window I could jump in. SD: During your education, whether at school or beyond, was there a farmer or farm that inspired you? PL: There's no one farmer that inspired me; it was the community that inspired me — being connected to all of these different people and having all of these resources available. I can call a huge list of people and ask, "Are you going to mow hay today?" or "I have a cow with this problem; what would you do?" I have a great list of mentors. SD: If you weren't a dairyman, what would you do for a job? PL: I want to retire into homesteading, if anything. That's kind of how I got into [farming]. I want to grow my own food. I've [also] built a lot of houses; I enjoy carpentry, and I really enjoy running equipment. It would be fun to teach and get more involved in education as time goes on and try to help other kids get into farming and get access to land. But I don't think I could have a job anymore. I couldn't go back to working for somebody else. SD: What's the weirdest or funniest farming story you're willing to share? PL: The first one that comes to mind, it's more about the drudgery of the dairy farmer. One Christmas Eve, Katt [Tolman], my business partner, and I were milking cows together in a rented barn where we started farming. It was an old barn with a gutter-cleaner chain that pulls the manure out into the manure pit. It's the end of the night, and I turn on the gutter cleaner, and the manure is going out, and I walk into the milk house for a minute. I step out and look down, and there's no chain. What had happened was, the chain had broken, and the entire 250 feet of steel had emptied itself out into the manure pit. So we both got into the manure pit and dragged it back in, piece by piece, and put it back together before we went to bed. We had to get it out that night before it froze, or it would have been there until spring. We didn't get upset or mad, [but] there may have been some tears. We have those all the time in farming, when you're problem solving on the fly, and all you have is your own stupidity to keep going. SD: What was the first kind of cheese you made? What drew you to that particular style? PL: I'd gone to my first farmers market with just milk, and I think I made $60. I said, "I have to do something different." I started with farmer cheese. Marisa Mauro [of Ploughgate Creamery] taught me how to make that. It was a recipe she'd brought back from California. That week, I made the first batch of that cheese, and I made as many flavors as I could. At the market that week I made $300, and I was like, "This is better!" SD: Generally, do you like eating cheeses from other parts of the world? PL: I guess I'm more apt to think about keeping as few miles on the food as possible. I could care less about eating cheese from France, to be honest. The story behind the cheese and having a direct connection to where it was made and grown is half the flavor for me. But you can go up to Québec and have access to an incredible amount of cheese. SD: When you have time to cook, what do you make? PL: I can't think of one meal that's my go-to, start to finish, but I pretty much cook three meals a day. I make breakfast every morning after I get done at the barn: eggs, greens, toast and coffee, my biggest meal of the day. At lunchtime, I usually make a point to come home and heat something up. And then, when I have time to cook in the evenings, I enjoy cooking meat. I try to work with what I have, and we always have pork and an incredible amount of beef. Chicken and fish are the things I crave a lot, because I don't have access to them as much. I love cooking fish. SD: What are you making for Thanksgiving this year? PL: We're having a Sweet Rowen Thanksgiving on Monday and cooking a big turkey from the neighbors, outside, trash-can-style. You cover the can in charcoal. Everybody else is going to bring pies, things like that. For my family's Thanksgiving, I usually just bring a cheese plate. I'll bring a couple loaves of bread and Storm, Mountain Ash, Solstice and any experimental cheeses we have hiding in the depths of the cheese cave. The experiments sometimes come out for the holidays. SD: Which accomplishment has made you the proudest? PL: I think some of the proudest moments for me are when a neighbor I know, [who] doesn't necessarily have the disposable income to spend extra money on food, tells me they love our milk and buy our milk. The original print version of this article was headlined "Curd Up"